Water devices, including pumps, are used for moving or lifting water from one location to another. Simple water devices have been in existence for thousands of years and were used for irrigation , domestic water needs, and livestock production. People, animals, or simple machines that harnessed natural forces, such as the wind or water currents, provided power for these devices. In the twentieth century, electricity became widely distributed in many countries, and traditional devices were largely replaced by more modern types, especially electric-powered ones. Several traditional devices—whose origins can be traced back hundreds, or even thousands, of years—were essential to the success of many ancient societies. Some traditional devices remain in operation today. Long before recorded history, people used buckets and pots to lift and carry water from its source. Wheels and paddles also were employed. The devices could be powered by humans or animals, by wind, or by the water itself. A few examples are discussed in the following paragraphs. Human-powered devices traditionally were used to move water short distances and up low grades. 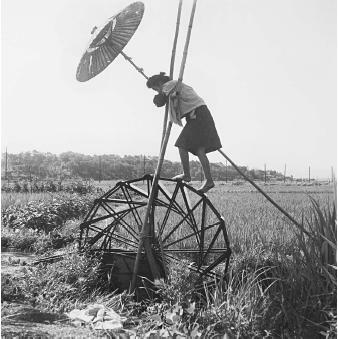 This irrigation wheel in Japan was still being used in 1958 to irrigate a small plot. An old and simple device that evolved from the hand-carried bucket, and that was used by the ancient Persians and Egyptians, was the shaduf. It consists of a pole with a bucket or pot on one end and a counterweight at the other end, and supported in between by a vertical post. A person grasps the pole and dips the bucket into a body of water such as a stream or river in order to fill it with water. The counterweight then lifts the bucket, and the bucket is swung over and emptied into an irrigation ditch. * The shaduf is still used in rural Egypt. An interesting variation using a bucket-type device was developed in ancient China. Sometimes called a "bail bail," it consists of a sheet or bucket stretched between two people by ropes. Still in use today, the bail bail usually is employed to irrigate small plots of land; water scooped from a stream or lake is quickly emptied into an adjacent irrigation ditch or field. An advancement over devices that used a reciprocating cycle (i.e., filling a container with water, dumping the water, then repeating the cycle) was the development of devices that scooped and emptied water in a continuous motion. The sakkia (or saquiyah), introduced by the ancient Persians during the fifth century B.C.E. , uses animal power to turn a wheel or chain that has numerous, evenly-spaced buckets attached. At the lowest point the buckets are filled with water, which are then emptied at the highest level. Like the shaduf, sakkias are still in use today. The noria (a type of water wheel) is similar to wheel-shaped or belt-like devices such as the sakkia in that the noria is a wheel with evenly spaced compartments arranged around its periphery. As the wheel turns, the compartments are dipped one-by-one into the water, and then emptied at the top into a holding tank, canal, or aqueduct . But unlike the human-powered and animal-powered devices, the noria is powered by water currents. Paddles attached to the wheel's rim turn it in reaction to the force of flowing water. The wheel is mounted on an axle between piers that carry the entire load of the structure. The diameter of the largest known noria is about 20 meters (over 60 feet). The Noria was used by the ancient Egyptians and Persians, and was described in 1 B.C.E. by a Roman named Vitruvius. The Muslim Arabs employed the noria extensively, and took it into their conquered lands, including Spain. Spanish priests introduced the noria to Mexico, where a few such devices are still in use today. As of 2002, there were seventeen surviving norias along the Orontes River in west-central Syria, in the city of Hama. Greek mathematician and inventor Archimedes (c. 287–212 B.C.E. ) 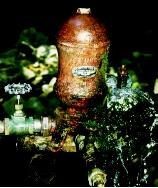 is thought by some historians to have devised the first screw pump around 250 B.C.E. It has thus come to be called the Archimedes Screw. One of the earliest kinds of pumps, the Archimedes Screw is basically a large helix, open at both ends and encased within a watertight cylinder. It operates with the cylinder somewhat tilted from vertical. When the open lower end of the cylinder is placed in water and the screw is turned, water trapped between the cylinder and the threads of the screw rises. Successive revolutions will raise the water thread-by-thread until it emerges at the top of the cylinder. The Archimedes Screw can be used to advantage where the water needs to be raised less than 1.5 meters (5 feet). In such cases, it is perhaps the most efficient of the ancient methods, because two men can raise an enormous volume of water in less than an hour (see photograph on page 14). The Archimedes Screw has been widely used over the centuries, especially to raise irrigation water and for land drainage, often being powered by people or animals. Besides being of simple construction, it has the additional advantage of being able to move water that contains mud, sand, or gravel. The Archimedes Screw is still used today in some limited applications (usually electrically-powered), and can range in size from a quarter of an inch to nearly 4 meters (12 feet) in diameter. A large screw or banks of screws may be used to pump rainstorm runoff or to lift water or wastewater, for example. The Archimedes Screw is a water-lifting device consisting of an enclosed cylinder containing a screw, whose turning blades bring up the water. 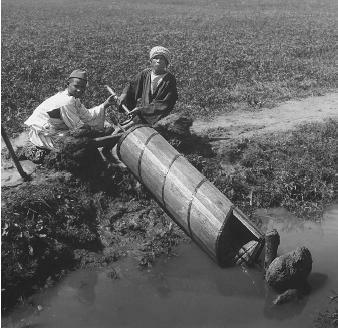 These farmers in Egypt's Nile delta turn a traditional screw by hand to irrigate a field. In a lift pump, a piston and cylinder are positioned vertically. Raising a handle that is attached to a piston encased in a pipe operates the lift pump. When the piston moves upward, atmospheric pressure pushes water into the cylinder to fill the empty space beneath the piston. A one-way valve closes after water enters the chamber, keeping the water from flowing back down into the well. Subsequent pumps of the piston pull more water into the chamber, which eventually overflows, spilling water out of a spout. Because atmospheric pressure will support a column of water no higher than about 10 meters (33 feet), a lift pump can raise water no further than this distance. Modern lift pumps intended for village or community wells often are specially designed to support heavy, sustained use. 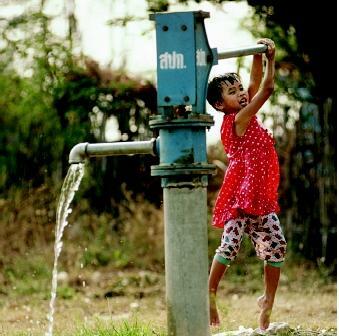 This girl pumps water in Phai Sali, Thailand. A hydraulic ram is a self-powered device which pumps water using only water pressure. The ram pump was invented in 1773 in England, and first patented in France in 1796. Unlike human-powered and animal-powered devices, the hydraulic ram is independent of any external power source. If a ram is properly located and periodically maintained, it can pump continuously for decades. Unlike norias and other water-powered wheels that use the energy of flowing water, hydraulic rams use the hydraulic head, or height difference, between the relatively elevated water source and the lower-elevated ram. Water from a spring, for example, is delivered through a downward-sloping drivepipe to a nearby ram. The ram pumps some of the inflowing water up a grade to its destination (often a storage tank), to an elevation that is 5, 10, or even 25 times greater than the head (or "fall") from source to ram. The greater the head (up to a 15-meter [50-foot] limit), the greater the height to which a ram can pump. If set up properly, some contemporary, heavy-duty rams can lift water as high as about 90 meters (nearly 300 feet). A hydraulic ram uses a combination of water pressure, air pressure, and gravity to pump water with no external power source (e.g., without electricity). The ram in this photograph dependably delivered spring water to a household in east-central Tennessee from the 1920s through the 1970s. The ram is shown in mid-stroke, when a spurt of water is wasted through an outside valve. The hydraulic ram itself operates using a combination of water pressure, air pressure, and gravity. Water from a spring, flowing well, or creek flows downward through a relatively large-diameter drivepipe and out through a waste valve on the ram. When the water reaches a certain velocity, the valve closes abruptly, causing an intense, momentary build-up of water pressure—like the "water hammer" bang in household water-pipes when somebody suddenly shuts off a faucet. This is an instantaneous pressure of great thrust, which forces an internal valve to open and admit water into an air chamber, where the inflowing water compresses the inside air. As the compressed air "rebounds," it forces water out into a relatively small-diameter delivery pipe. The opening of the check valve causes the waste valve to open again, and the process repeats. The whole process repeats about once every 2–3 seconds, "ramming" more water up the delivery pipe with each ram stroke. Stroke frequency will vary with ram size and with the desired amount of flow regulation. Although uncommon, rams are still manufactured today, and can serve as fuel-efficient alternatives on farms, nurseries, private water systems, and other low-volume water uses. All that is required for a ram installation is about 1 meter (roughly 3 feet) of driving head, and a steady inflow of approximately 95 liters (25 gallons) per minute. A typical ram installation can supply between 3,785 and 37,850 liters (1,000 and 10,000 gallons) per day. Rams can be installed in batteries of two or more when a single ram does not have the capacity required, or when the supply of water varies during the year (i.e., some rams can be disengaged during periods of inadequate flow). Hydraulic rams can be useful in remote areas and in developing countries where electricity (for an electric motor) and gasoline (for a gas engine) are not readily available for powering modern pumps. SEE ALSO Developing Countries, Issues in ; Irrigation Management ; Irrigation Systems, Ancient ; Pumps, Modern ; Water works, Ancient . Fraenkel, Peter, and Jeremy Thake, eds. Water Lifting Devices: A Handbook for Users and Choosers. Rome, Italy: Food and Agriculture Organization of the United Nations, 1986. A Water-Lifting Device—Sakia from Egypt. Department of Rural Engineering and Natural Resource Protection, University of Kassel. <http://www.wiz.uni-kassel.de/kww/projekte/pumpen/sakia_i.html> . Hazen, Theodore R. "The Noria Water Wheels." The Water Wheel Album—Page Five. <http://www.angelfire.com/journal/millbuilder/album5.html> . Hydraulic Ram Collector. Don Burger. <http://dburger.tripod.com> . Pump Basics for Deep Wells and Pitcher Pumps. AntiqueStove.com . <http://www.antiquestoves.com/pump.htm> . Thomas, Terry. "Disseminating Ram-Pump Technology." 20th WEDC Conference: Colombo, Sri Lanka, 1994. <http://lboro.lut.ac.uk/departments/cv/wedc/papers/thomas2.html> . Water Pumping. Otherpower.com . <http://www.otherpower.com/otherpower_waterpumping.html> . * See "Developing Countries, Issues in" for a photograph of a traditional hand pump being used—during a flood, ironically. * See "Irrigation Management" for a photograph of Vietnamese farmers operating a looped water-moving device. * See "Irrigation Systems, Ancient" for an illustration of shadufs being used. * See "Microbes in Lakes and Streams" for a photograph of a small handheld water pump. wow thanx so much ths website has gien me alot of information for my coming speach called: water is the center of ciilization in the ancient world.